On Sunday 7th October, Isobel Crowther, Sally Crocker and I put out a solid performance at the Chippenham 3-up team time trial. This was a fantastic event and we all thoroughly enjoyed racing for Avid amongst the many SAS black and red jerseys that surrounded us. The course was mostly flat with a few rolling hills with only left-hand turns. We arrived at Minety village hall near Malmesbury early, the sun was out with blue sky, but it didn’t quite have the heat yet as there was frost still in the field we parked in. We gathered in the warm village hall together before rolling down for a warm up and start. The start turned out to be a bit further than we expected and ended up just getting there a minute before our start time!! The held start was good (thanks to all those practices in training!) and we were away starting the rotations smoothly as ever despite the road surface being the worst ever. There was plenty of teamwork and encouragement shown throughout the course using each other’s strengths on different parts. My favourite part was towards the end when there was a nice flat, straight road that we managed to rotate consistently increasing our speed rapidly before we turned left and heard Chris Crowther shout “It’s all downhill from here”, these were the best words we’d heard for the last hour and gave us a final boost to the finish. As we rolled back into the village hall, we were greeted with plenty of hot drinks and cake ready for the prize giving. Congratulations to all but we were all very happy finishing in 1:05:00 just in front of a team of males on time trial bikes! Overall a great event to experience and I would highly recommend it to get some more blue and white teams to next year! 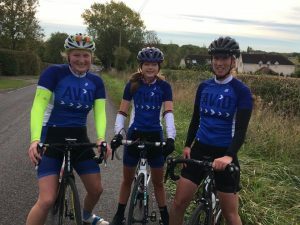 Odd Down Summer Series – Women’s Overall Standings Odd Down Winter Series 2019: What’s New?